Upon arrival in Italy, the undocumented foreign citizen seeking international protection is sent to the Accommodation Centres for Asylum Seekers (CARAs) to be identified and to begin the procedures for the recognition of international protection. Asylum seekers should stay for up to of 35 days pending the approval of their requests by the competent Territorial Commission. The system is characterized by oversized, remote centres, high costs and low-quality services. As per LD 142/2015, CARAs should be simply converted into “government-run first reception centres”, that is, replaced by regional or interregional government-run centres for asylum seekers, the so-called “hubs” envisaged by Italy’s Roadmap. Any person who, outside his or her country of origin, files a request for international protection in another State, or has expressed his or her will to do so. Asylum seekers remain such pending the decision by the designated authorities regarding the recognition of refugee status or other forms of protection. Seven CIES are currently operating in Italy: Turin, Rome, Crotone, Bari, Brindisi, Trapani and Caltanissetta. The two CIEs in Milan and Gradisca will be reopened according to Italy’s Roadmap. Foreign citizens can be detained up to 90 days, a limit that has drastically reduced from 18 months. Detention of asylum seekers can last up to 12 months. Tragically, the time of detention actually depends on how long it takes for the asylum request to be processed. Coming into effect on January 1st 2014, the Dublin III Regulation establishes criteria to determine which Member State is responsible for deciding an application for asylum filed by a third-country citizen or a stateless person. The general underlying principle is that any asylum request must be examined by only one Member State. The responsibility to decide on a request falls primarily on the Member State where the applicant has first entered the European Union, with some exceptions. Conceived to obviate the lack of available places in the ordinary reception facilities or in the services provided by local organizations, in case of massive and frequent arrivals of migrants. To this day, they are the customary mode of reception. Such facilities are designated by the Prefectures, in agreement with cooperatives, associations and hotels, in accordance with public contracts regulations, with the local authorities being informed. Accommodation should be limited to the time strictly necessary for the transfer of the applicant in second reception centres. 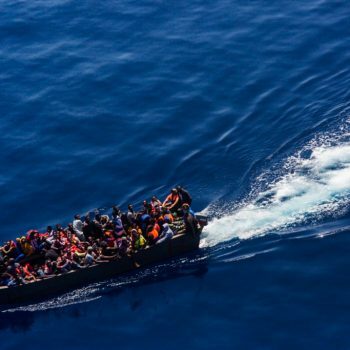 The European Agenda on Migration envisages the creation of these centres on the outer borders of the Union for the purposes of registration, photo-identification and fingerprinting of the disembarked migrants within 48 hours (72 hours maximum) of arrival. In case they refuse registration, they will be transferred to CIEs to be identified and repatriated. The primary objective is the identification, and the immediate sorting, between those who have a right to request protection and those who must be repatriated (the so-called “economic migrants”), calling into question the fundamental principle of a necessary evaluation of the personal motivations behind each request for asylum. Basically, the police will proceed to ? Six ports have been identified: Pozzallo, Porto Empedocle, Trapani, Lampedusa (already operating on an experimental basis), Augusta and Taranto. Greece has also begun experimenting the hotspot approach. Within the new Roadmap submitted by the Italian Ministry of Interiors, hubs are conceived as large, regional or interregional centres to be used in the early phases of reception for migrants who have expressed the will to request protection. These facilities will be created by converting former Accommodation Centres for Asylum Seekers (CARAs) and First Reception Centres (CDA). They will basically function as short-term facilities for registration, identification and formalizing of asylum requests, followed by transfer to second phase reception in facilities that are part of the SPRAR network. Since hubs provide unlimited accommodation time, they are at risk of presenting the same uncertainties as the current reception system. A residual form of protection available to those not eligible for refugee status, who do not have a right to subsidiary protection but cannot be removed from national territory because of objective and serious personal situations. The residence permit for humanitarian reasons is issued by the Questore following a recommendation by the Territorial Commission in case of refusal, when “serious reasons of a humanitarian nature” exist (such as age or health, or in the case of victims of grave political instability, episodes of violence, insufficient respect for human rights, famine or natural or environmental disasters), or at the direct request of the foreign citizen. The permit is valid for two years and can be converted into a residence permit for work. Originally meaning a space that is by definition safe and inviolable, the term currently designates a form of protection that an individual can request from a State while in its territory, when said individual is deprived of fundamental rights and democratic freedoms in his or her country of origin. Therefore, it generally concerns individuals who are forced to relocation. Right of asylum is recognized primarily by Article 14 of the Universal Declaration of Human Rights of December 1948, as well as by several documents of the European Union and by Article 10 of the Italian Constitution, yet it is not enforced by actual law. Within the new European Agenda on Migration, migrants seeking protection on arrival in Italy, Greece and Hungary can be relocated across Europe. Basically a selection process available to people in clear need of international protection, belonging to nationalities whose recognition of international protection is equal to or greater than 75%, based on Eurostat data: at present Syrians, Eritreans and Iraqis. From hotspots, people who have been selected for relocation are first transferred to the designated hubs, where their profiles are matched for compatibility with the available places in Member States. The Protection System for Asylum and Refuge Seekers, the so-called “second reception”, is established by the Department for Civil Liberties and Immigration of the Ministry of Interior and operated by Anci (the National Association of Italian Municipalities). Applicants who have filed a request for asylum and have no means of subsistence (determined by the welfare check annual amount) are brought into the system of secondary level reception centres. Besides food and shelter, centres must provide services such as linguistic and cultural mediation, Italian language courses, vocational training and guidance and legal assistance so as to facilitate integration. Accommodation is granted for six months, which can be extended for a further six months and is in any case guaranteed until the decision of the Territorial Commission or, in case of appeal, until the outcome of the suspension request and/or the definition of the first degree proceeding. A form of protection that can be granted by the competent Territorial Commission to a person seeking asylum, when the applicant cannot prove that he or she is at risk of personal persecution, but would risk serious injury in the country of origin (death sentence, torture, serious and individual threat to life or person by reason of indiscriminate violence in situations of armed conflict), so that he or she cannot or does not want to benefit from the protection of said country. The residence permit under subsidiary protection is valid for 5 years, and it can be renewed if the reason for its issuing persist. The permit also grants access to education, employment and National Health Service.